The Road to California quilt block is comprised of one of my favourite quilt patches -- the flying geese unit. (This should really be called a "flying goose" unit, but then, who am I to be deciding?) Anyway, this block can be made in all sorts of interesting ways. 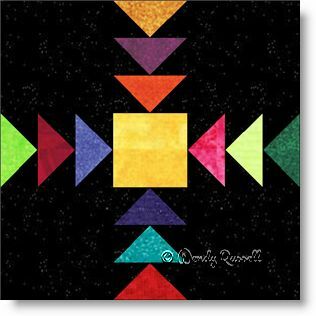 I have chosen to make a "scrappy" quilt block, with a dark background (to represent the night sky). You might decide to use two fabrics only, one dark and one light, or mix it up in some other way. The construction of each block is made as an uneven nine patch. You can really see how different you can make this quilt just by looking at the sample quilts illustrated. One quilt has a straight setting, with blocks side by side and the other features the blocks set on point giving a totally different look.